We had some time to kill before our meeting on September 7th with the Grote cousins who live on the old farmstead, so we drove up to the hamlet of Evenhausen to see if we could locate the former farm Number One. All farm numbers have been changed with the advent of the modern postal system. Some longtime residents of these villages still know the old numbers. After a few dead ends, we pulled into an attractive farmstead and no sooner had James parked the van than a tall fellow wearing a green hunter’s coat and beret came out. In a friendly manner, he asked if he could help us. Within minutes, we had learned that old Farm Number One was just across the street. OK, problem solved. What made our visit with this fellow, Juergen Lueklin so special, is that he explained all about the special Lippische Farmhouses which dot the landscape all around Lippe-Detmold. 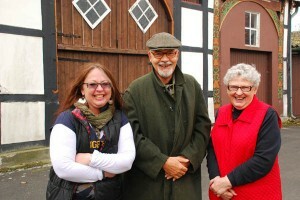 The Lippische Farmhouse developed over many centuries, he told us. First, the people were the least important members of the farm household. Under one roof lived all of the animals except for the pigs. Pigs smell rotten, he told us. At least cows and horses smell good, even their waste is not totally offensive. The horses received the prime spot in the house, in the rooms facing east. The cows were kept in stalls facing west. Facing south, the main entrance door to the inner courtyard, a covered area with hard mud where threshing sometimes took place. This exact arrangement can be seen at the ancestral Grote farm, except the current residents keep a large hay wagon in the barn and this blocks the view of the people’s place, which is on the north side. Posted in Family History Tours and tagged farmhouses, lippishe.